We got a great book out from the library today and spent a fun half hour doing an activity from it that Ollie chose. 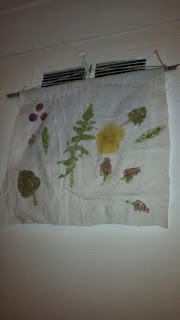 The basic idea is to pound vegetation on to fabric, releasing it's coloured juices and making a pretty picture. We adored this activity and can't believe I've never seen it done before. It was incredibly easy and suitable for almost any age group. We did it in the kitchen, but it would be perfect for making keepsakes to take home from an outing or an outdoor party. The basic kit is really simple. You will need fresh flowers, leaves and stems. Even at this time of year we got plenty from a quick foray into the front yard. We picked heather, olive leaves, lemon balm leaves, a primrose, a fern leaf, an oxalis leaf and an ornamental quince flower. You will also need a piece of white(ish) fabric - I used cheap curtain liner cotton because I have lots of remnants, but a piece cut from an old pillow case or sheet would work fine. You also need masking tape, something to pound your flowers with such as a hammer or rolling pin (or a rock if you're outdoors) and something to pound on - we used a wooden bread board. Stage 1: Tape your leaves, stems and flowers on to whichever side of the fabric you designate as 'right side'. I removed every-other pair of leaves from the fern because it was a bit small and crowed together. Step 2: Put the fabric right-side down on a surface that won't mind a pounding. Hammer on the back of the fabric until all the juices are released from your vegetation. 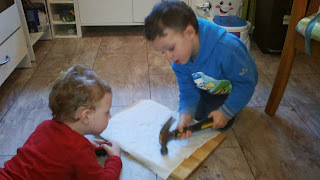 We started off with a hammer, but switched to rolling pins because the boys each have a small wooden one and I thought they were less likely to do themselves or each other a mischief with these than with the claw hammer. I went over it all with my big rolling pin after they had their fill of it. Warning!! Close supervision required to avoid children smacking themselves or someone else on the head, in the eye, on the nose, their fingers ... you get the picture. If you have little ones who aren't great at following directions just at the moment you may decide you need to take over the hammering. Also, this part is really really noisy, so how long you spend hammering and where you do it will depend on how much noise you think your neighbours can take before they explode. 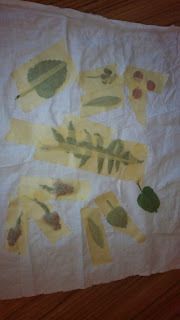 Step 3: Peel off the masking tape and bits of squashed vegetation. Stage 4: use a blunt table knife to gently scrape off any remaining bits of squishiness. Stage 5: repeat with extra flowers and leaves if you think you have too many blank spaces, then decide how you want to display your masterpiece. I folded the top of our fabric and did a quick running stitch, then poked a stick through and tied string to the ends. 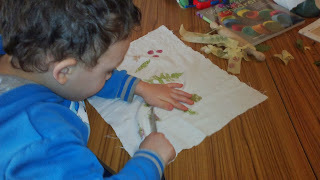 If you want to achieve a neater effect you could also hem the fabric and use a prettier stick and a nice bit of ribbon. You could alternatively frame your picture, or sew it on to a bag or cushion. The colours are not fixed though so you won't be able to wash the fabric. The exception is apparently fern leaves which will darken with washing but not be washed out, making them a good choice for printing a pattern on to a t-shirt. We will definitely be trying this whenever we can find a less weather beaten bit of fern. Precautions - the obvious ones mentioned above such as trying to avoid bashed fingers, plus close supervision and guidance while picking the vegetation. 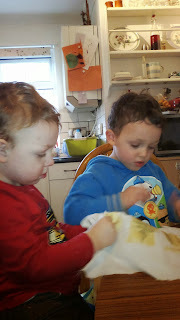 As with any project for children I would only use plants which I know to be safe if accidentally ingested in small amounts and which will not be irritating or otherwise unpleasant. Always check local restrictions on picking vegetation if it's not from your own property, but generally common wildflowers (we could be mean and call them weeds) are fair game so long as you don't rip up the whole thing. If in doubt stick with easily recognised, edible flowers such as pansies, dandelions, nasturtiums, roses and of course culinary herbs such as mint.